Not Posh this time... This little fella has become as friendly as her, however, so I call him Boy George...a run of British singer's names, I suppose! I love that Tigger can be fascinated with the animals in the yard without running them off! He was waiting to come in, but enjoying the squirrel and I had time to enjoy them both! Oh my Louise I just love how Tigger sits and watches! Your garden is the opposite of mine! I can just imagine what would happen if Finlay caught sight of any of your visitors! He would be chasing them round and round and then wouldn’t rest for hours as he would be “on guard”. I want some of your magic please! Love Boy George's music! Great name for little nut boy. Wonderful shot - and how fortunate that your cat is happy to just watch and not devour. It's wonderful that you can enjoy scenes such as these. He he ... share and share alike. Nice! When you move down your feed and see a cat and a squirrel you know it has to Louise. Awww, your peaceable kingdom is so great! Boy George LOL!! Cat must be singing "do you really want to hurt me...."
Ha ha! Stand off! What a brave little guy! How wonderful that they get along so well. Priceless photo. Love that perspective. 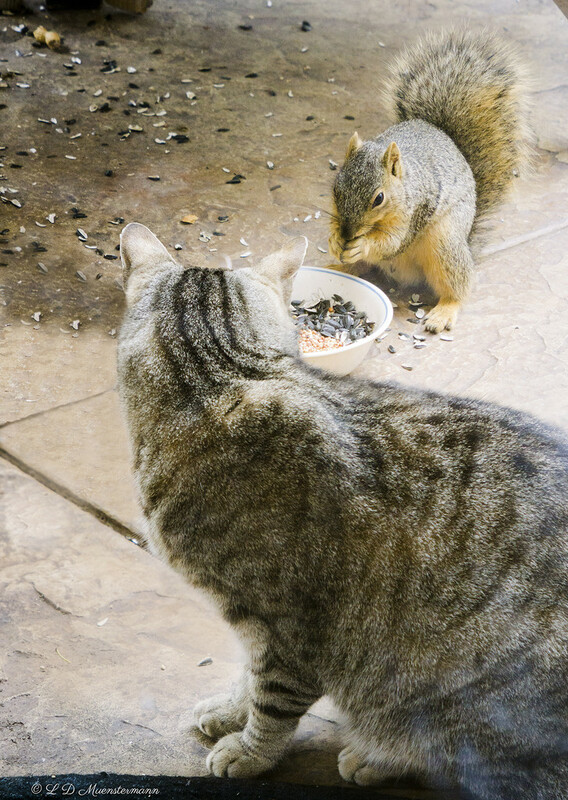 Amazing that Tigger lets the squirrels do their thing without any interference. You've obviously had some influence there! I love your furry friends, and their friendly coexistence! @blightygal I love it! I went to give you a fav for the comment and realized "I had to actually write a reply!" So nice to see you! I remember *way back* when you were featuring your squirrel! Yes, Tigger seems quite charmed by his backyard companions & they have no fear of him, which I equally love!! !